Orthographic Projection: is a way of drawing an object from different directions (views). There are two ways of drawing in orthographic, First Angle and Third Angle – they differ only in the position of the views. In the example below, we will focus on the Third Angle System. Note: Every print may not include all six illustrations. The views that are included on a print obtains important information that is required for the operator. Views are excluded if they do not contain essential information or details. 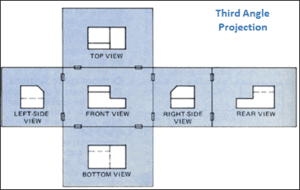 Isometric Projection: A method for visually representing three dimensional objects in two dimensions in technical and engineering drawings. 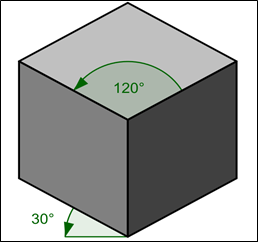 An Isometric view of an object can be obtained by choosing the viewing direction such that the angles between the projections of the x,y, and z axes are all the same, or 120 degrees.